The Second Age: What Is Sandy Hook About? What Is Sandy Hook About? 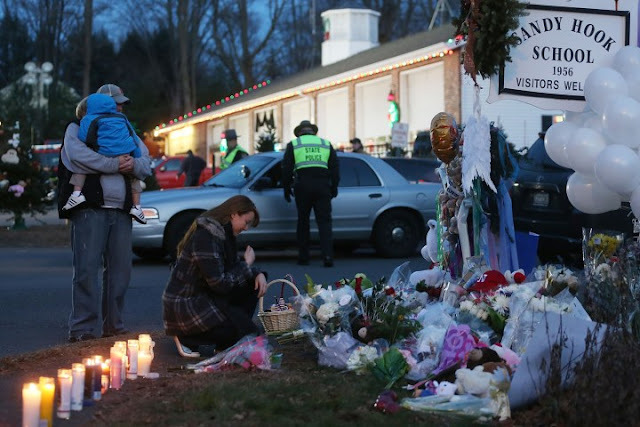 Over the past few days there have been a very vocal contingent of those calling for increased gun control in the wake of the horrible massacre at Sandy Hook Elementary School in Newtown, Connecticut. We've seen New York City Mayor Michael Bloomberg on Meet the Press. We've seen Joe Scarborough, a former Congressman given the highest rating from the NRA, come out in favor of increased gun control. Even West Virginia Senator Joe Manchin - who was endorsed by the NRA in the 2012 senate election and even made a campaign ad in which he shot a copy of the cap and trade bill with a rifle - has had positive things to say about potential gun control legislation. One notable absence from the national dialogue about guns in America is the National Rifle Association. They've been silent on their Twitter account and deactivated their Facebook page, mere days after bragging about the more than 1.7 million "Likes" it had received. This is not rare, as the NRA has remained silent in the face of national tragedy before. Additionally, many senators refused to talk about their support for gun rights over the weekend. Meet the Press asked 31 pro-gun senators if they wanted to appear on Sunday's show. Not one accepted. For such a principled group like the NRA, to be silent when those principles are called into question does not look good. There are two main reasons for something like this, neither of which bodes well for the group. On the one hand, they could be wavering in their views and slowly coming to the view that many Americans have: this country needs stricter gun control. I highly doubt this, as the NRA is the group that held their annual convention in Denver not 11 days after the Columbine massacre less than 15 miles away. The second - and more plausible reason - is that in this day and age, many of the NRA's positions are indefensible. No citizen needs assault weapons. Someone like Nancy Lanza didn't need five guns. Hunting these days is for pure sport, not survival. Other countries have tightened gun restrictions in the wake of shooting tragedies with positive results. Why can't we do the same in America? While the NRA and many elected officials have been silent, some pro-gun individuals have spoken out - but not about guns. They point to everything but in order to deflect the blame from easy access to guns. Mike Huckabee is the forerunner here, blaming everything from no prayer in schools to gays to abortion pills to smartphones to evolution. But he's not alone. I won't dignify other talking heads who have spoken out about this in even more ridiculous ways by analyzing their statements here. I'll agree that mental health plays a role in this tragedy, and it is certainly something to talk about, but it's not the main point. I would pose this question who feel mental health plays a greater role than access to guns: what's easier to ban, mental disease or firearms? The answer is obvious. So at the end of day it's not about God or gays or smartphones. It's not even primarily about mental health. It's about guns. On a more personal note, this is not some screed from some lifelong anti-gun crusader. I've shot many kinds of guns, and while I have never been a card-carrying member of the NRA (by any stretch of the imagination), I have not been very vocal about restricting guns in the past. I even planned on owning a gun when I lived in a part of the country that allowed it (essentially anywhere but New York City). Newtown has changed that. There's no valid reason I need a gun. There's no reason this country needs to have higher gun ownership per capita than one of the poorest countries in the Middle East with a weak central government. I refuse to add to that statistic and add another firearm to a country already saturated with them. I don't need a 21st century killing tool governed by 18th century doctrine. I feel - and hope - that after the heartbreaking events on Friday that many will join me in this thinking.